When you plan to do outdoor work such as landscaping, installing a fence or pool, or excavating for construction, call before you dig. CEL&P is a member of the Indiana Underground Plant Protection Service, a free statewide service that will notify your utility companies to send representatives to the site and clearly mark the location of their underground lines and pipes. This is important to prevent injury and property damage. Call 811 OR (800) 382-5544 at least two full working days, excluding weekends and holidays, before digging. Outline your project with white paint. Call IUPPS at 811 or 800-382-5544 at least “two full working days” but not more than 20 calendar days prior to the start of your project. 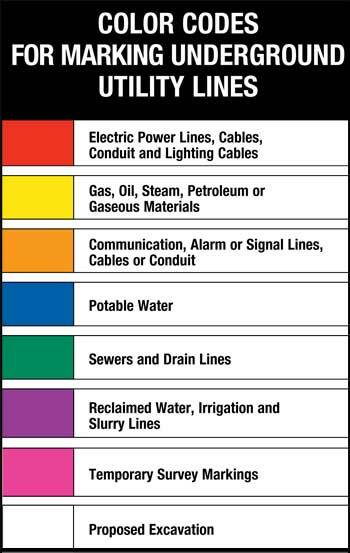 When all utilities have been checked in the area you will see either a dotted line on the ground or a flag with an “OK” painted on the ground in each color on the chart. The dotted line means underground lines exist in the area for that facility while the flag and “OK” indicate that a facility does not have underground lines in that location, but that the area has been checked by that facility. At least the first four colors — red, yellow, orange and blue — must be shown before you can begin digging safely. Dig with care! Stay at least 24 inches away from the buried facility. If you’re planting a tree, remember to consider the length of the roots as the tree grows, and don’t plant large trees below overhead power lines. For more information on this service visit the Indiana 811 website.